The ancient castle has lost the favor of the dragons, and now it is our chance to earn that favor for ourselves. 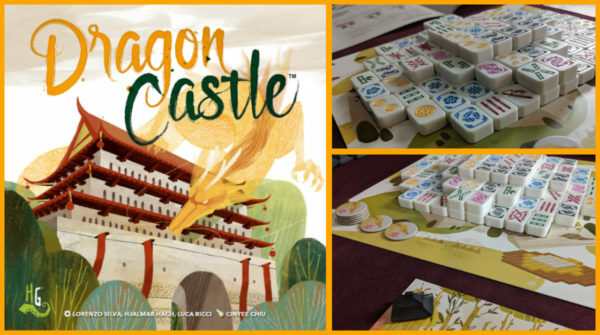 That’s the premise of Dragon Castle, this week’s review. Players take turns removing tiles from the center castle and placing them into their own castles. By placing tiles from similar factions or sets strategically, players can maximize the points they get for “consolidating” them, or flipping them over. Once they’ve been flipped, you can build more layers or place shrines for even more points. The most skillful players will also take advantage of the random Spirit and Dragon cards to boost their strategies. Check out our full thoughts in this week’s episode. We’ve been playing some other really exciting games as well. Teotihuacan: City of Gods is a solid worker placement game with a highly integrated theme, and Age of Mythology captures the spirit of the classic video game that both Jakub and Greg really enjoyed. While you’re thinking about board games, make sure to reserve your tickets to this year’s WashingCon! Tickets go on sale at 7 PM on April 1. They’re $40 for the first week, so act fast! You can find them at washingcon.com.